The competitive interdependent world economy forces professionals to seek out advantages to succeed. Immediately improve your Business English skills to achieve the personal and professional success you want and deserve. Receive sound advice on the top 10 English skills at the office. Consider this book a primer for professionals who accept the challenge to boost their knowledge and skills of Business English rapidly in a very short time period. It is a call to action for those of you are struggling to perfect your Business English language skills in order to take them to the next level. Get a competitive advantage over colleagues and customers in order to succeed in a global economy using Business English. 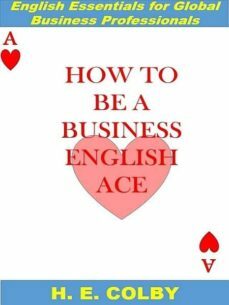 Learn how to be a Business English Ace!